What’s that on Von Braun’s desk? A Hugo, answers G. Patrick Molloy. Through May the U.S. Space & Rocket Center in Huntsville is presenting “100 Years of Von Braun: His American Journey”. 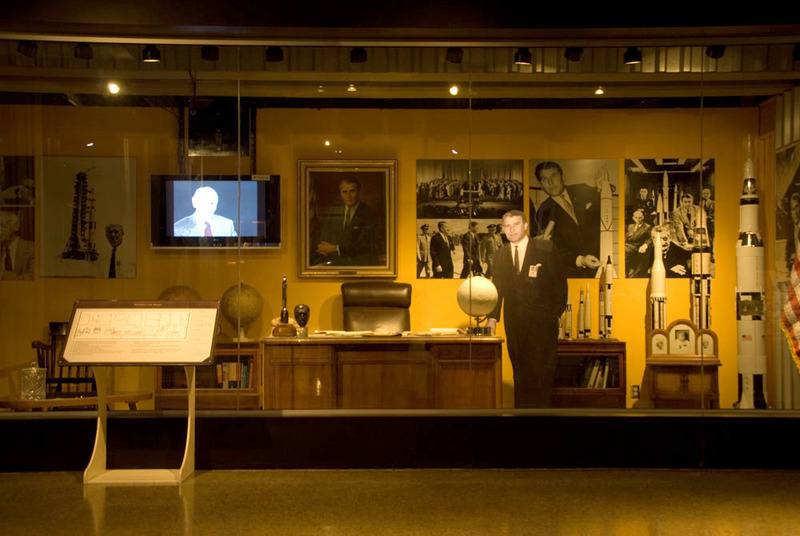 It includes a re-creation of Werhner Von Braun’s office with all the souvenirs, models photos and knick-knacks that used to festoon the place. 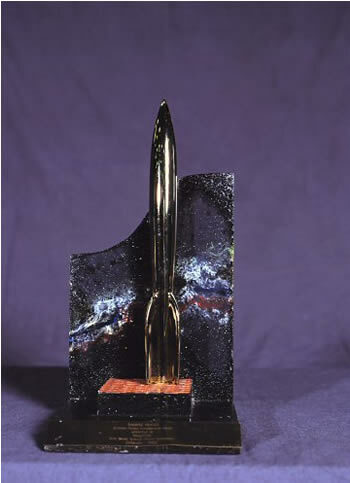 This is not an award Von Braun received in his lifetime. Rather it is the Retro Hugo for Best Related Book voted to Conquest of the Moon by Werhner von Braun, Fred Whipple, and Willy Ley in 2004. Molloy, due his connection with NASA, took responsibility for finding a proper home for the award. He got the Von Braun archive to accept it. Since then, the Hugo rocket has been exhibited several times together with other things the scientist once owned. How Tall Is The Hugo? How tall is the Hugo rocket? As a matter of fact, a chrome Hugo rocket is thirteen inches tall. But what I am really asking you to do is put your imagination to work, then tell me: What sized rocket do you think the Hugo is modeled on? John Hertz and I came up with this question while we were discussing the spate of silly controversies that plagued Nippon 2007’s Hugo Awards. 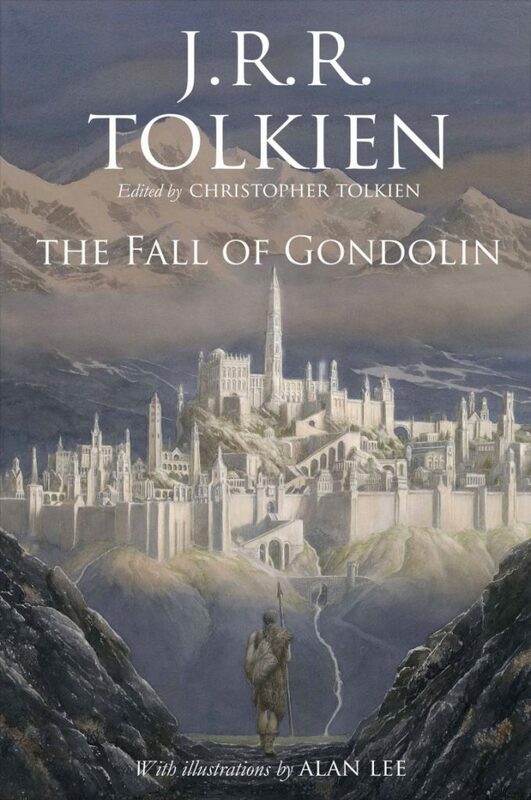 The last one was about the Hugo Award base. From all the griping you’d think the Japanese superhero Ultraman practically dwarfed the Hugo rocket. A lot of fans thought it was perfectly fine for a Japanese Worldcon to honor an icon from its country’s sf tradition. But for or against, all fans seemed to take for granted that the figure of Ultraman was exaggerated. No one ever asked whether Ultraman and the rocket might, in fact, be in proper proportion to one another, or how to find that answer. Ultraman is supposed to be 130 feet tall. Just how big do we conceive the Hugo rocket to be? In the popular imagination the hypothetical, life-sized Hugo rocket has taken on mythic proportions with the passing years. 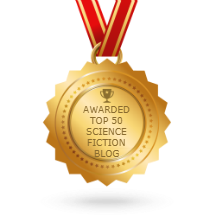 To honor the 50th anniversary of the first Worldcon, the 1989 Hugo Award base took inspiration from the signature buildings of the 1939 New York World’s Fair, the Trylon and Perisphere. Connected to the Trylon, which stood 700 feet tall, by what was at the time the world’s longest escalator, was the Perisphere, 180 feet in diameter. So in the 1989 base design the Hugo rocket stood in for a 700-foot-tall tower. 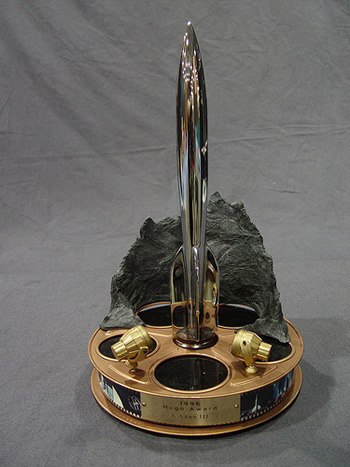 Three years later, Phil Tortoricci designed the 1992 Hugos, with special gold-plated rockets on his beautifully-made bases. He hand-painted an astronomical scene on each black stone backdrop. The rockets rested on little squares of orange grating from the original Pad 29 where America’s first satellite was launched. That was the Explorer-1 satellite launched on a multi-stage Jupiter-C rocket in 1958. I’m sure that by 1992 fans were used to seeing historic footage of missions launched with the huge Saturn V rocket, 363 feet tall (shorter than the Trylon, but still mighty big.) In fact, the rocket that launched our first satellite was just 71 feet tall – something Ultraman actually could tower over! The fairest measure of the relative size of Ultraman and the Hugo rocket can be found by identifying the rocket ship that inspired the Hugo design. 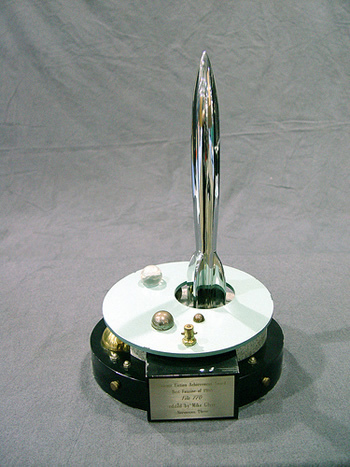 The official Hugo Awards site says, “The earliest Hugo Award trophies used a rocket hood ornament from a 1950s American automobile…” Hopefully that will soon be corrected –accurate information is already posted elsehwere on the same site about Jack McKnight’s role in manufacturing the first Hugos. The use of hood ornaments wasn’t proposed until the Hugos (which missed a year) were revived in 1955 by the Cleveland Worldcon committee. They hoped Jack McKnight would make their Hugo rockets, too, but their letters brought no replies. Nick Falasca asked, couldn’t they simply use Oldsmobile “Rocket 88” model hood ornaments? They ordered one of the ornaments from the local dealer. Unfortunately, the rocket had a hollow underside; hood ornaments did not prove to be a cheap and easy solution after all. 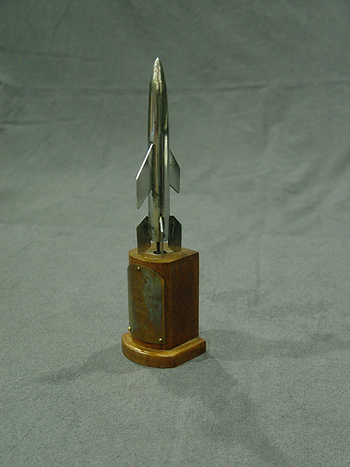 Instead, Ben Jason had the Hoffman Bronze Co. prepare a pattern rocket from his design, and that rocket does bear a resemblance to the 88 logo from the trunk lid of a 1955 Oldsmobile “Rocket 88.” That’s the Hugo rocket shape in use to this day. In the end, the fairest and most logical answer is that our hypothetical Hugo is the same size as Destination Moon’s Luna, 150 feet tall. 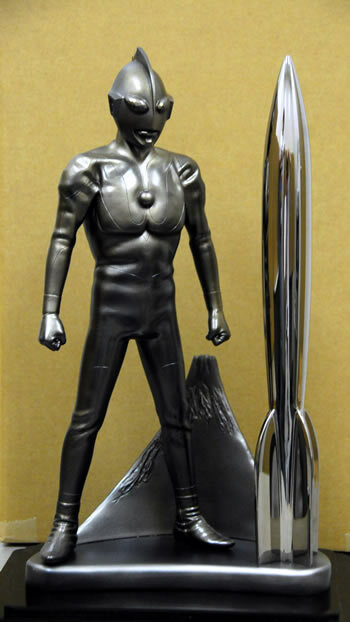 That makes the Hugo similar in size to the legendary Ultraman, and allows us to conclude the Nippon 2007 base shows the two images in proper proportion. Case closed.